2-1/4 H.P. 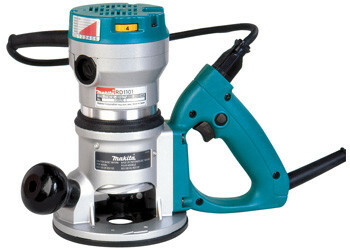 D-Handle Router, 8,000-24,000 RPM, var. spd. RD1101 - 2-1/4 H.P. D-Handle Router, 8,000-24,000 RPM, var. spd. Variable Speed (8,000 - 24,000 RPM). Quietest (81dB) and lowest vibration router in its class. Electronic speed control maintains constant speed under load. Soft start feature for smooth start-ups. Rugged aluminum motor housing with small 3-1/4" diameter for easy handling. Sub-base accepts industry standard template guides for convenience. Industrial cam-lock for fast and easy depth adjustment and removal of motor. Durable flat top design for stability when changing bits. Bits are installed/removed with two identical size wrenches. All ball bearing construction for long tool life. Front knob can be placed in two locations for left or right handed operators. Large calibrated depth control ring for easy depth adjustment. Accepts 1/2" and 1/4" shank bits.